Every year at this time I start feeling nostalgic for autumn. The fresh sharp smell of fall in the air, the beautiful leaves, apple orchards, pumpkins, pre-Halloween excitement, and the list goes on. Some years I get to go back to Wisconsin this time of year, which is lovely. I remember when my first daughter was a year and a half and we visited my parents in Wisconsin in September. It was so fun being able to go outside any time of the day we wanted to run around in the yard, swing, etc. She had such fun! Here in Malaysia we always wait until after 5 or 6pm to go outside as it’s just too hot and the sun is too strong! Last year we went in November so it was more chilly, but still fun. This fall we are not going to Wisconsin, so I wanted to do something else fun to celebrate the fall season. As the temperatures fall and people are spending more time indoors crafting, I thought it’d be great to do some giveaways! So I’m having several weeks of giveaways here on the blog! I still have a few supplies leftover from when I was selling quilling supplies, so those will be the prizes. I’ll plan to post each Friday. I thought of doing just one big prize, but I thought it’d be more fun to do several smaller prizes. All of the giveaways will be open worldwide, yay! 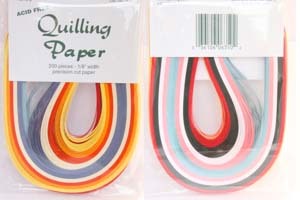 Week 1 will be a pack of variety quilling paper, narrow width. Narrow papers (approximately 1/16″ or 1.5mm) are especially great for cardmarking because cards can still be easily put into envelopes without the quilling being squashed. They are also fun to use for details on 3D miniatures and for jewelry as well. This variety pack of paper comes with 200 strips in 10 colors (so 20 strips of each color) and is from Lake City Craft brand. The colors are yellow, light orange, orange, white, blue, red, green, bright white, pink, light blue. One way to get an entry is to leave a comment on this blog post answering a question. 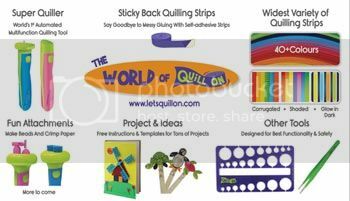 The question asks what sort of quilling supplies you’d like to see for the rest of the giveaways. Some of the things I have left include a few little kits, a few basic quilling supplies, supplies to make jewelry, bookmarks, a few more paper strips, and some big sheets of fun papers. The giveaway runs through September 25th and the winner will be announced within a few days after that (I will announce on facebook and also email the winner). There are many ways to enter, so have fun! **prizes will be sent out within 1-3 weeks Don’t go anywhere, there is lots to see here on the blog! Click here to view free paper quilling tutorials! Click here to view paper quilling tips and tricks! 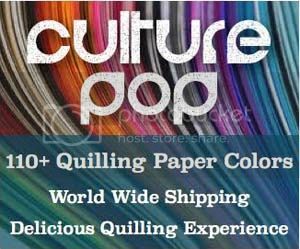 Click here to view a list of places to buy quilling supplies around the world! Click here to view some of my own quilling projects, with tips so you can make your own if you’d like! I would like to see jewelry supplies. Im new to quilling but i love everything about it. I have even made Christmas presents this year by quilling. Minecraft’s pieces made with quilling technique. That is a fun way to get through Autumn! 🙂 Enjoy! I am new to quilling so absolutely anything would be appreciated! I purchased a basic starter kit and just finished my 1st project. I decorated an 8″ wooden letter “S” to give to my friend Sarah for her brand new appartment. I love that I can make original gifts that no one else will give. I would love to see more quilling kits. The best part about quilling is learning something new. Absolutely love love love your work! You take quilling to a whole new level! Would love to see Diamond Glaze on your list of giveaways…. We don’t get it here in India and I am dying to try it out! Jewellery supplies. I love your work. I love any give always. Especially paper…. Can never have enough quilling strips!!! Thank you for the contest!! I would like to see tools. Especially the border buddy … I can’t seem to get it here in Canada, and I would love to have one. I love quilling.and much inspired by your blog.stared making quilling earings.i would. Like to see more of your tutorials. I love the idea of jewelry accessories for giveaways. I’m not sure what a border buddy is but I’m sure I need one of those too. Thanks for the great blog and all the great tutorials. Tengo muy mala suerte en los sorteos ,pero no pierdo nada con intentarlo. Cualquier cosita para trabajar filigrana es muuuuy bienvenida, sobre todo si llega desde muuuy lejos. Love your work and helped me a lot at beginning to get started. It would be good to have PPA sealent as we couldn’t find here in India. I would love to see supplies for making jewelry, as I would love to try that and haven`t yet. Iwould like to have crimping tool in the next giveawY. I would love to see more jewelry making items. I’m not sure, I just started quilling but I would love to incorporated into my jewelry making. I would like to see some jewellery supplies since i have started quilling again after a very long break post pregnancy…it keeps me sane. I would like to see tools as I love your beautiful work and tutorials and would like to do them with the proper equipment. Hoping you’ll include quilling slotted tool and tweezer in the next giveaway. Thanks! The first time i went through your blog i got really interested in paper quilling…I got all the supplies from you. I really loved to do jewellery especially Jhumka Earrings and your tutorials really helped me alot at the beginning..thank you so much for the help..and i love to see more supply on jewellery making especially jhumka earring as it is today’s fashion trends. I’m new to quilling but I love every bit of it. It totally keeps you enthralled . After rreading your blog and learning various nuances of quilling, I have stopped playing games on facebook- something no one could get me to do for years. Your blog keeps me enthralled- wanting to try out everything immediately! kEEP GOING! Oh wow, thanks so much for your comment! I have to agree that it is easy to get caught up in quilling! I’d like to possibly see some of Little Circles quilling paper. She has a lot of really vibrant colors I absolutely love!